Prepare yourself to be taken on a journey into the history, wildlife, and beauty of the Old West in the Jerry Thomas Gallery and Collection. The beautiful gallery building, designed with Southwest architectural accents, is a spacious 5,000 square foot state of the art facility adjoining the El Quartelejo Museum. The gallery houses an array of original artwork by renowned artist Jerry Thomas. Patrons will also be entertained by the fascinating and beautiful collection of Western Heritage items and relics, including items actually used by Jerry in the creation of his paintings. These collections include beautiful Native American, Civil War, Indian War, and cowboy trail items. 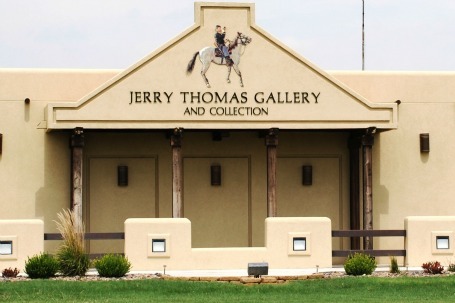 The Jerry Thomas Gallery and Collections will be a must see destination point for wildlife and western art enthusiasts and those who appreciate the stories and memorabilia of the Old West. Open Tuesday - Saturday, 1-5 p.m. or by appointment. Call 620.874.1559 or 620.872.3523.